Technically a tile game, not card, but close. A classic. 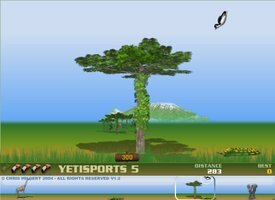 A nice variation on the popular yeti sports game, this one involves some challenge and skill. Yes, those crazy game makers are still finding ways to make it fun to put 3 like-colored pieces next to each other. This time with cute graphics and terribly enjoyable sounds. A very simple game to play, takes just two buttons. Time it carefully so you can grab the big gold pieces, or if you're good the diamonds. I could play this for hours. A version of the classic Kaboom! game where you are catching falling bombs. Run around with your shotgun, shooting enemies out of the air. Hit more than one with a single shot to win bonuses. Vertical scroller. You're a bubble, and you have to grow by assimilating other bubbles floating past. But don't hit the spiky things! The mice are having a party, but they're too dumb to find the cheese. Help them find the way. We've all heard of Breakout. Bouncing ball, paddle, busting blocks. But in this version, you have paddles on all four sides. Action packed! Think arkanoid, but round. Gotta play it to get it. Racing snails! The excitement! The speed! Get the black squares. Stay away from the red squares! A kind of whack-a-mole game, but using the keyboard. Sound and graphics are great. Starts out slow, but trust me it gets action packed quick! Zed is an android. But unlike other androids he has always had a very special dream - to sport a space suit entirely made of gold. Run through this platform game collecting gold pieces for Zed, but avoid the monsters and traps! It's Marble Madness. Don't fall off! A variation on a true classic. A great Arkanoid clone. Bounce the ball off your paddle into the blocks on the screen, and clear it all! As it's name implies this is a bit like Super Mario World. It's a side scroller type game, run through the worlds collecting coins, but avoid the bad guys! What games section would be complete without tetris? Retro style shoot-em-up. You're a space ship, flying around shooting the bad guys. Action packed! Nice video poker game. Includes a "Double Up" round where you can bet on a random card for double or quadruple your winnings. Very nice graphics. The wasting-time-on-a-computer classic, solitaire. I prefer 3-card draw, but this is the nicest version I've been able to find. It's Japanese, so no instructions, but it's loads of fun. High quality graphics and sound, too! After finding three-or-more tiles of the same color, pick them to be eliminated, and choose the direction the pieces to fill the space will come from. Manipulate the board to move the special tiles to the right places to advance. A strange combination between bubble shooter and tetris. Spin the board to get the colored rings to fall in the right place: three or more together will disappear. Clear the board to reach the new level. The first few are boring, but then they get action packed! To enter a level code, just type it at the opening screen instead of clicking play. It's sudoku. Mouse driven, which is nice for idle play. Help Joe save Chasmton from a drought! A very engaging puzzle game. Reminds me a bit of Space Quest / Kings Quest. We all know the game, move your colored pieces to the other side of the board. You're a worker on the Golden Gate bridge. You're bored. Throw water balloons at passing cars! Yes, the windows classic, in flash reincarnation. If Chasm reminded me of the later Space Quest games that were mouse based, this reminds me of the earlier text based versions. In fact, it's a faithful reproduction of the genre, very nostalgic. A simple game that can really satisfy your destructive urges. Pile a bunch of explosives underneath a warthog tank. Make it bounce around the screen to hit some funky looking alien creatures. Try it, I dare you! Save the monkey! Build a bridge for him across shark infested waters. Nearly impossible, but I have done it. This is a variation on the classic peg game that in my childhood I knew as "Hi IQ." In this version instead of pegs, there are blobs. Jump one blob over another to clear all but one from the board. Given a field of squares, connect all the squares together with straight lines. Move crabs around the board to get them all home at the same time. Just like road blocks, with a few more nifty bits. Move your block around the screen, bounce off of other blocks, don't fall off, and get to the goal! Fun puzzle game, move the ball to the exit, but don't fall off the board! Higher levels have fun twists. A deceptively simple game, the goal is to knock your opponent's balls out of the square playing area without losing your own. A lot like pool, with good physics simulation, this game gets hard quick, as you get fewer and fewer balls of your own to work with. It's mini golf with Dumbo, the elephant. Challenging, but fun. The 'play' button is invisble, but it's in the top-right of the white area. A simple but very engaging game similar to the board game Risk. Territories battle to take over the world. 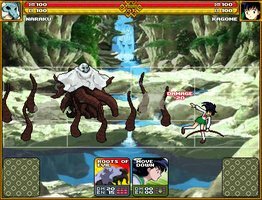 A turn based game that is a mix between Final Fantasy and Street Fighter. Very fun. A turn based card battle game. Take a look at the Maganic Wars official site if you like it! Take part in the exciting world of high finance! Buy and sell real estate until you can afford the mansion at the end of the block. Rotate pipes and elbows to create loops, which clear from the board. Very difficult. I have a strange fascination for connect-the-path type games. This one really sticks out though, a little girl's life is at stake! Keep the train on the tracks. Build fast! Hordes of monsters are rushing to attack your tower. Build turrets to defend it. It's hangman. Except, it's a kangaroo. Nice graphics and sound. Just like the GSN game show Lingo, you're given the first letter and have to guess the five letter word. You earn more points for taking fewer guesses.